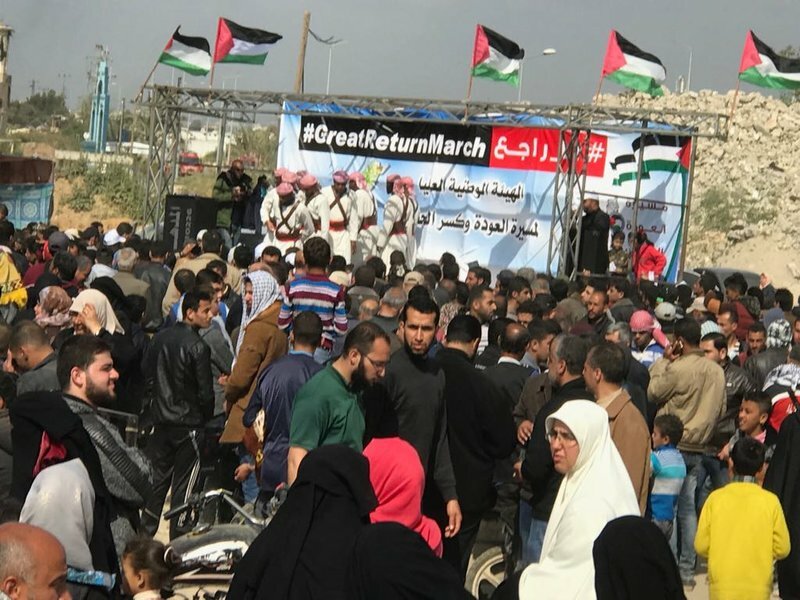 On March 30, unarmed Gazan Palestinians marched to the border. Until 1948, the land on the other side had been their families’ home. 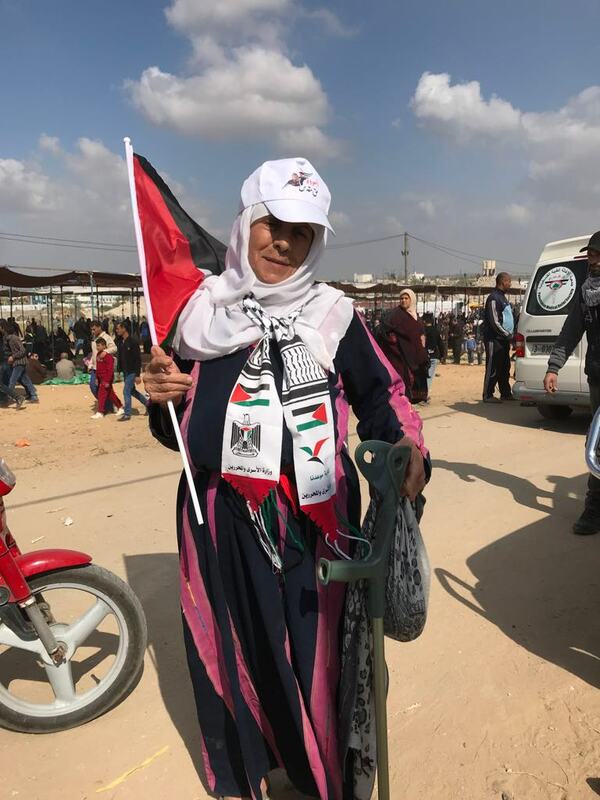 Then, came the Nakba—“catastrophe”—when Israel was created and they were pushed off their land—many of them forced to settle in the densely packed Gaza Strip. 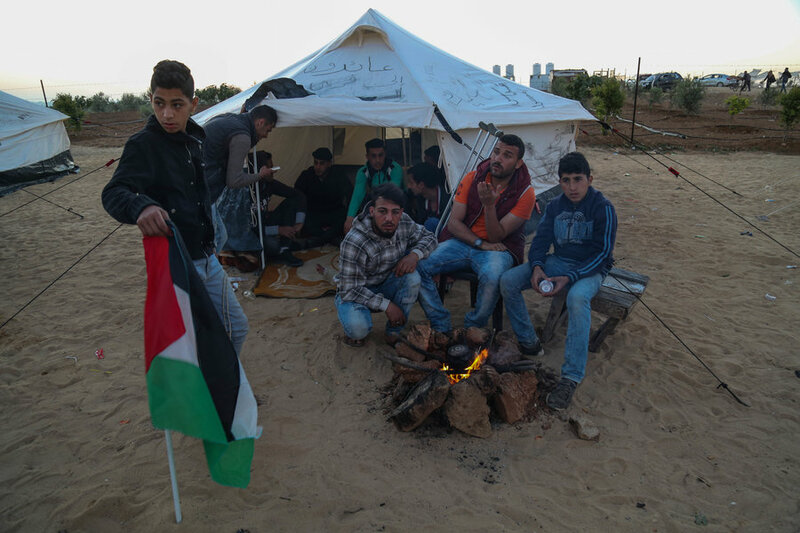 Seventy years have passed and today, about 70 percent of Gaza residents are refugees. On that Friday, more than a quarter of a million Palestinians congregated to march nonviolently to remind the world of their right to return. Fares Reqeb is shown in the lead, helping to carry out the injured. Later, he too was killed. 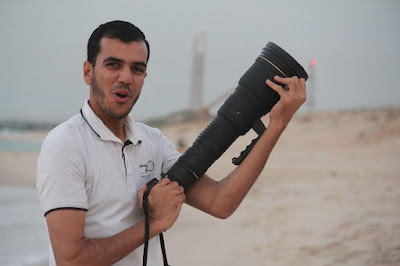 One of them was Fares al-Reqeb, 26. He also was one of 22 Palestinian protesters who died from injuries received that day. He was shot in the stomach by one of about 100 Israeli snipers. Doctors believe he was hit by either by an “exploding bullet” or high-velocity munitions normally used for targets a long distance away. He remained anesthetized and unconscious until he died of his wounds three days later, at 7 a.m. April 2 in Khan Younis’ European Hospital. "We aren’t the terrorists; those who killed Fares are the terrorists," says Fareed, Fares' older brother. 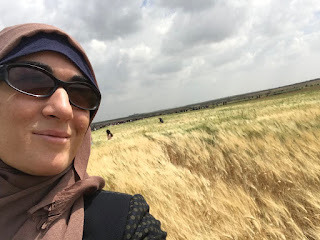 "We witnessed the Israeli occupation forces shoot an old woman at the border, just before Fares was injured." 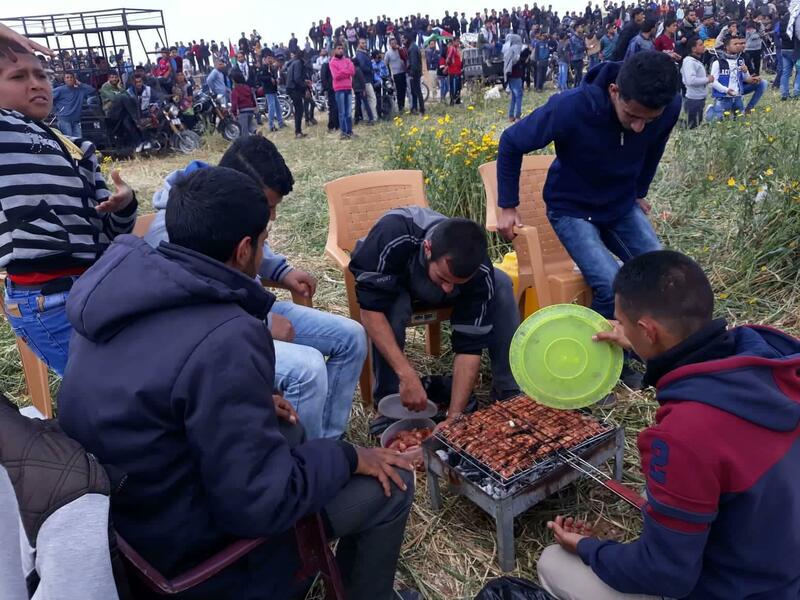 Fares, who lived in a community in the Khan Younis area, in southern Gaza, left school at 17 to try to find work, earning income in construction, supermarkets and restaurants. Nevertheless, despite his hard life, Fareed says Fares was always smiling and loved to play with children. He married his wife, Bader, and had two boys, 3 and 5 years old. Bader is five months pregnant with their third child. 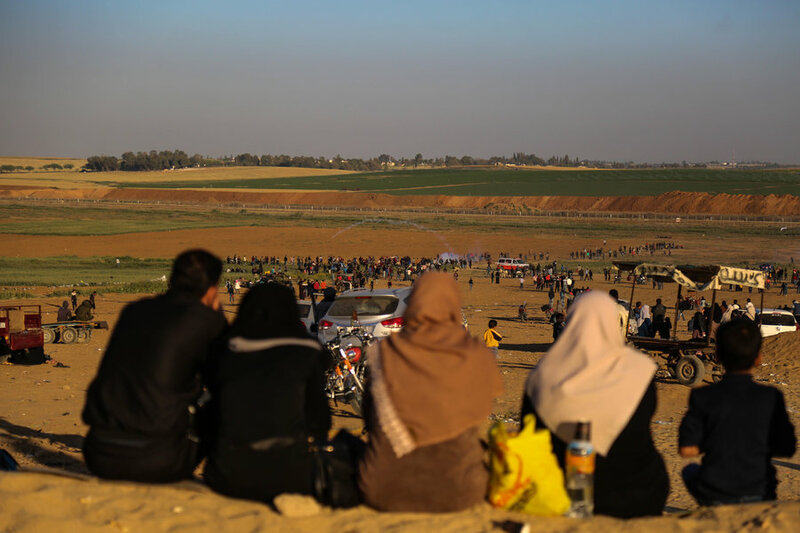 Although Fares joined the Islamic Jihad movement in 2015, frequently helping to guard the Gaza borders at night, his family says he participated in the demonstration in a spirit of nonviolent unity. All political factions have come together for the march. "Fares went to protest peacefully against the occupation of our land," Bader says. "The martyrdom of Fares shows to the world that Israel is willing to kill Palestinians even if they are peacefully asking for their rights." To date, 29 Palestinian protesters have been killed, and 2,850—including 24 women and 81 minors—have been injured. Seventy-nine are in serious condition, according to Ashraf al-Qedra, spokesman for the Gaza Health Ministry. In addition, Israeli authorities confirmed they are holding the bodies of two Palestinians who were killed while trying to cross the border March 30. The al-Reqeb family, like many others in the Gaza Strip, was displaced from Jaffa by Israeli occupation forces in 1948. 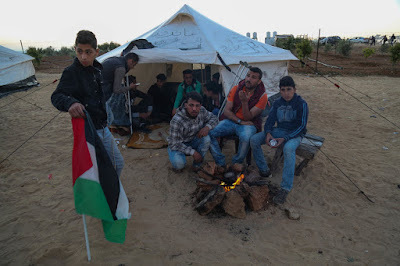 Sixty-eight percent of Gaza residents are refugees, according to the Wafa Information Center. 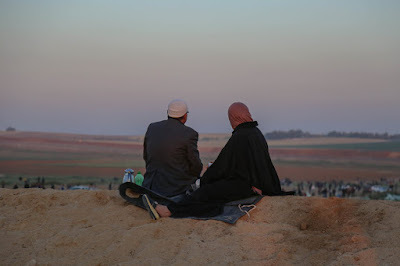 They were forced to move to the Gaza Strip, while others were massacred. Fares went to the border to protest with a large number of his relatives, including women and children, early Friday morning, March 30. They took a grill and some meat, since they were planning to spend the whole day there. 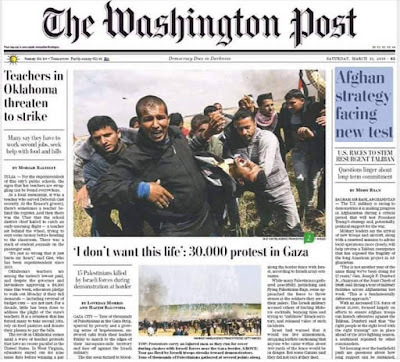 In a photo taken of him and featured on the front page of the U.S. newspaper The Washington Post, Fares is seen helping nurses carry the injured to ambulances. 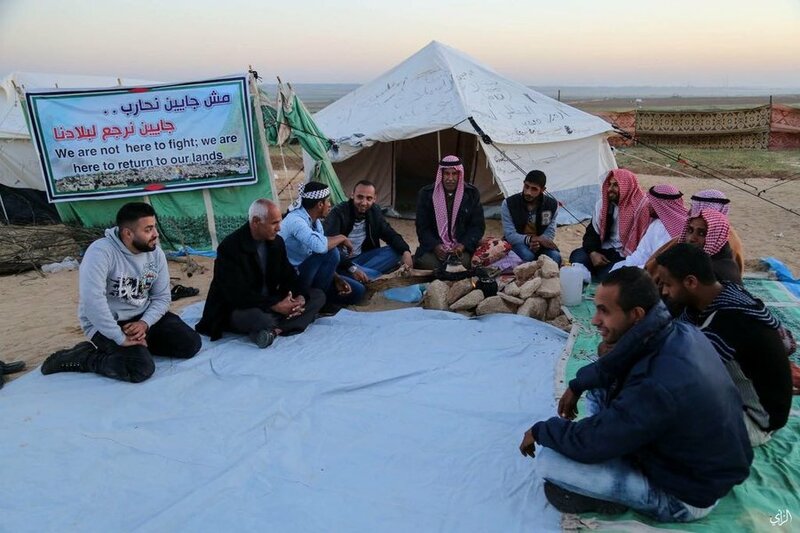 "He told me he thought he would be killed there, but I thought he was joking,” his nephew, Mohammed, recalls sadly. 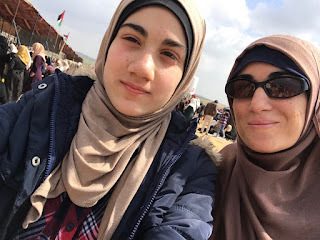 "My uncle was shot about 60 meters away from the separation fence. Nothing was in his hands; he was not even holding a stone!" 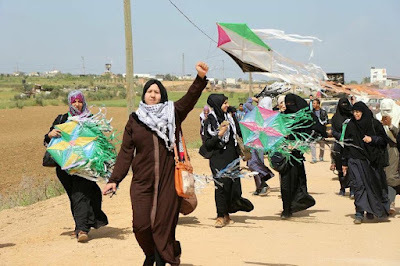 Ismail Haniyeh, the senior political leader of Hamas, which governs Gaza, said in a written statement that the Palestinian right of return to their homeland must be more than a motto. 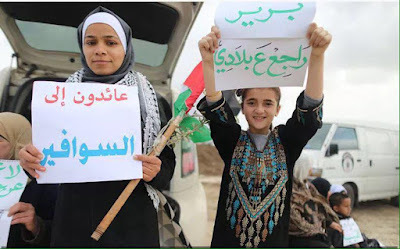 "Since [U.S. President Donald] Trump's recognition of Jerusalem as the capital of Israel, many other country leaders have started to support normalization with Israel. 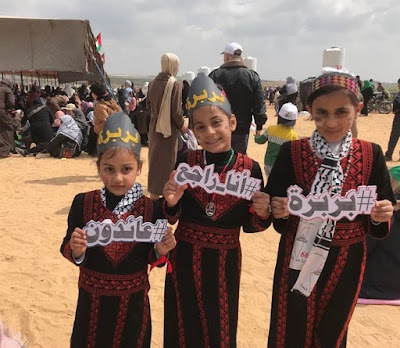 Gazan Palestinians are sending a message to the world that for us, there is no alternative than a return to our homeland, Palestine," Haniyeh said. On April 6, Palestinian photojournalist Yasser Murtaja was covering Gaza's Great Return March, a six-week demonstration along the Israeli border to call attention to Palestinians' right to return to their ancestral homeland. He was shot by an Israeli sniper, dying of his wounds. His heart races to see his homeland. To tell the truth of his people. The scariest of weapons for his killers. seeks to steal his words. Yet his words will live.